Using the right credit card for your frequent business travel will help you earn rewards that you can use toward future flights. Or, your credit card may come with other benefits and perks that help you move through the airport quickly and with ease. Pick a credit card with no foreign transaction fee if you travel out of the country to save money on purchases you make in other currencies. Whether you’re a small business owner yourself or an employee who travels for business, there’s a credit card here that’s just right for you. 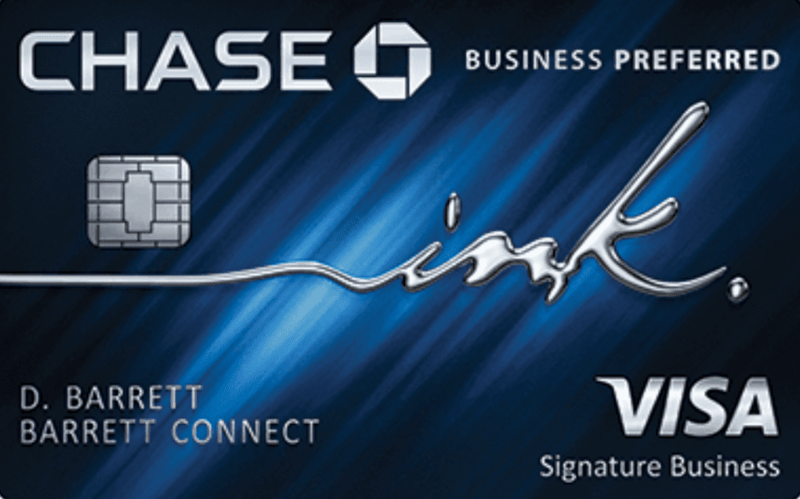 With the Chase Ink Business Preferred Card, you have the opportunity to earn 80,000 bonus points. Just spend $5,000 on purchases in the first three months after opening your account to earn the bonus. Use Chase’s online booking tool, Chase Ultimate Rewards, to redeem your points and the bonus is worth up to $1,000 toward travel rewards. You’ll earn three points for every dollar you spend on the first $150,000 you spend on travel and other business purchases each year. In addition to travel expenses, business purchases include shipping, internet, cable and phone, as well as social media/search engine advertising purchases. You’ll earn one point per dollar on all your other purchases. Use your rewards to book travel in advance through Chase Ultimate Rewards and your points are worth 25% more. Important Pricing: The regular APR is 18.24%-23.24% variable. The annual fee is $95, and there’s no foreign transaction fee. With the Business Platinum Card from American Express, you’ll earn 50,000 Membership Rewards points after you spend $10,000 and an additional 25,000 points when you spend $10,000 more on qualifying purchases within your first three months of opening your account. That’s up to 75,000 bonus Membership Rewards if you can meet the required spending. Between flights, hotels, and rental cars, frequent travelers may not have a hard time earning the bonus rewards. You’ll earn five points per every dollar you spend on flights and prepaid hotels that you book through American Express' online booking tool at amextravel.com; 1.5 points per dollar on eligible business purchases of $5,000 or more—up to 1 million points; and one point per dollar on everything else. Plus, enjoy a $200 airline fee credit each year that you can to apply toward incidental fees like checked bags and in-flight purchases. Important Pricing: There’s a $595 annual fee and no foreign transaction fee. The Business Platinum Card from American Express is a charge card, which means you pay your balance in full each month. Earn up to 60,000 bonus miles, 40,000 after you spend $2,000 on purchases in the first three months, plus an additional 20,000 after spending $8,000 on purchases in the first six months of opening your account. Then, earn two miles per dollar spent on United purchases and at restaurants and on hotel accommodations when purchased directly with the hotel. Plus, earn one mile per dollar on everything else. There's no limit for the miles you can earn and no expiration date. Receive a statement credit of up to $100 every four years as reimbursement for the application fee for Global Entry or TSA Precheck when charged to your Explorer card. You and one companion traveling on the same reservation will each receive the first standard checked bag free on United-operated flights when purchasing tickets with your United Explorer card. Important Pricing: The APR is 18.24% 25.24% variable. The annual fee is $0 for the first year and $95 each year after that. There’s no foreign transaction fee. With the Capital One Spark Miles you’ll earn a one-time bonus of 50,000 miles if you spend $4,500 on purchases within the first three months of opening your credit card account. The bonus is worth up to $500 in travel. All your purchases, including business travel purchases, will earn unlimited two miles for every dollar. You can redeem your rewards at any time, in any amount. There are no blackout dates, and your rewards never expire as long as you keep your account in good standing. If you have a business partner who travels with you, you can add additional employee cards to earn additional rewards. Important Pricing: The APR for purchases is 19.24% variable. There’s a $95 fee that’s waived in the first year, and there’s no foreign transaction fee. The signup bonus is a generous 50,000 bonus points if you spend $3,000 in the first 90 days of opening your account. Ongoing, you’ll earn two points for every dollar you spend on travel and dining purchases and 1.5 points per dollar spent on everything else. The Bank of America Premium Rewards Credit Card offers a $100 credit for the Global Entry or TSA Precheck application fee every four years—two benefits that make it easier and faster to move through airport security and customs. The bank also rewards an additional $100 statement credit for airline incidentals like seat upgrades, baggage fees, in-flight services and airport lounge fees. There’s no limit to the points you can earn, and your points don’t expire. You can redeem your points for cash back as a statement credit, as a deposit into an eligible Bank of America account or to book travel through the Bank of America Travel Center. Important Pricing: The APR is 18.24%-25.24% variable, the annual fee is $95 and there is no foreign transaction fee. Best debit cards for international travel. WIth the Citi AAdvantage Platinum Select World Elite MasterCard, you’ll earn 60,000 bonus miles after you make $3,000 in purchases in the first three months of opening your account. Ongoing, you’ll earn two AAdvantage miles for every dollar spent on American Airlines purchases and at restaurants and gas stations, and one AAdvantage mile for every dollar spent on other purchases. Earn a $125 American Airlines Flight Discount after you spend $20,000 or more in purchases during your card membership year and renew your card. Get priority boarding, and your first checked bag is free. Use your credit card for in-flight food and beverage purchases and receive a 25% savings on your purchase. Important Pricing: APR is 18.24%-26.24% variable, based on your creditworthiness. There’s a $99 annual fee that’s waived in the first year and no foreign transaction fee.